After our little glitch, the floor has been successfully poured and it's set. The joiners and the plumber were here last week, so we're back to where we were two weeks ago. Well, that's not strictly true - the builders have been here and have put in the roof vents, tidied up any loose slates and have sarted work on the guttering and downpipes. Next week, we should have the plumber and the electrician, then the plasterboarding will start on the 13th September. "Fired Earth", from whom we are getting the tiles for the kitchen and hall, want us to check the measurements - they think we need more tiles than are ordered. The cynic in me says this has something to do with the fact that we're not using their installation service. If you do, they're on sale or return; if you use your own tiler, as we are, you can't return any surplus. I may be doing them a disservice but we'll measure carefully tomorrow. Leo is our new Ryeland tup. We bought him today at the Rare Breed Sale at Thainstone. He's a shearling from Raymond Aitken's Fetternear flock, so he's white. There were no registered coloured tups (and no coloured females at all) at the sale and I was anxious that I wasn't left with no tup, but believe me, he's not second best. That's what our west paddock has become. We weaned the two tup lambs today - wish we'd video'd it. Jinx lies down if you catch her and try to move her - she must teach her lambs to do it too. Her boy just flopped when we tried to walk him round to the paddock. Nothing daunted, we put him on the flat bed trolley and gave him a wee hurl. Worked fine! We've identified the walled garden as the site for our eventual soft fruit garden. It's 12m x 9m, roughly and walled on three sides; the fourth side adjoins the barn and is now open. John and Linda cleared part of it in May and planted some spuds and beans. We're now clearing the rest. The weird thing is that despite all the pulling of weeds, I haven't seen a single worm and we reckon that this is due to a lack of organic matter in the soil. I was grooming the ponies yesterday and thinking how nice it must be for them to be pretty much fly free now. After I turned them out, I had a look at the sheep. Luna, one of the gimmers, was switching her tail and stamping - fly strike! I brought them all into the hurdle pen, caught her and tied her up on the halter (what a great thing that is!). I cut away the wool at the affected part and doused the area with Crovect. I cannot tell you the satisfaction I felt when the little b@stards started dying and dropping off. Read more on Don't let your guard down! It's a terrible day here today, weatherwise. It's been really windy for a couple of days - our gazebo finally gave up the ghost yesterday and had to be quickly dismantled - but now we have heavy rain, driven by the gales. Actually, I'm so glad I took the gazebo down yesterday - it would have been a hideous job today. On the positive side, the bad weather has reminded Bertie that he does actually live here and he's curled up on the bed with Harry. He's become semi-feral since we moved here - coming in twice a day to eat and for a quick cuddle before shooting out again to wherever he lays up. We weaned the two tup lambs last week and put them in with Buddy, Leo and Dickie in the wee paddock behind the West range. One lamb's five months and he's getting a bit frisky, so it probably was good timing. However, there's not much grass in there now and I don't want a) the tups to lose condition and b) the lambs to stop growing, so I decided that they could go into Five Acre Field this weekend. It's glorious here today, but breezy - a good drying day, so the washing is done and out. The ewes are still bawling at having no grass - so much so, I gave them a leaf of hay to shut them up. Dickie is back with the boys - they absconded yesterday to find him and spring him from wherever he'd been imprisoned. The joiner came and asked if three sheep should be wandering about. Actually there were four, so I let Dickie out to join them and they all followed me back to the field. I must have left the gate ajar. It's been a good week. We've had electricians, joiners, the plasterer (who's also the brickie, slater and all round star) and, yesterday and today, the blokes to install the plant for the heat pump. It all looks very complicated and there is a huge pile of technical manuals - I won't be reading them. The week after next, the ground works for the heat pump loop will be done and a new mains water pipe installed - then the heat pump and plumbing can be commissioned. We've decided to run water into the West range at the same time - seems daft not too. Joiners have been busy today. Most of the framing and insulation is done and all the ceilings are up apart from the kitchen. They aren't here tomorrow - steel for the other job is being delivered tomorrow. The electricians will be here though, and I think some of the joiners will be back on Friday. The Ames taper has been here; he is also doing the external painterwork. Since he will be here anyway, he's giving us a price for the internal painting. Hope he likes Magnolia. The lights for the dining room and living room were delivered today. Steve Reid was in today to discuss arrangements for the working pony demo on 25th September. We still have some places left, if anyone else wants to come along. Smokey and Bugsy are going to be the demo ponies. I took Smokey out yesterday on long reins. He was just great. He was keen, but was listening and his transitions were very good. He also stood well at the level crossing, where we waited for two trains to pass. Bugsy is a novice but he's a smart wee pony, curious and likes people, so I think he'll enjoy learning something new. I'm reading a book called "Caring for Cows" by Valerie Porter. It's very good - not technical or aimed at commercial cattle keepers. I'm feeling more relaxed about getting ours now. Smokey and I had an interesting experience with some dogs today. I took him out on longreins along the cycle track, as I did on Tuesday. Now on Tuesday, I met a nice lady who's a dog walker. She explained that she had a Great Dane that wasn't very good with horses and that she used the cycle track regularly. I said if I saw her van, I'd go the other way. I could hear the dog barking in the van as we were talking. When we set off today, the van was at the end of the track. I could hear the dog barking so I thought I'd just go the way I'd gone before. A few hundred yards along the track, there's a couple of bends. As we went round the second one, we met the Great Dane coming the other way. It was black and the insides of its eyes were red - just as well I wasn't letting my imagination run wild, as it looked like demon dog. Read more on Smokey the magnificent! Well, men and women and boys, in fact. 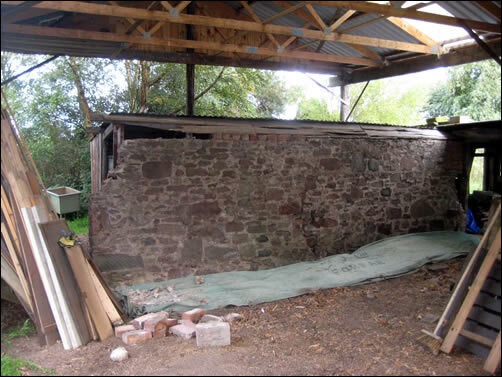 This weekend's project was to demolish the old stone and timber shed inside the opensided barn. Saturday saw Dan, Tony and Rebecca, our neighbours, their boys, Sam and Alex, and our chum, Karen and I all ready to go. Dan was up early and started taking off the top course of bricks, then Tony arrived and took off the wriggly tin roof. Tony then took down the wood cladding, while Karen stoked the fire and burned the rotten wood. Meantime, everyone else was knocking down the wall or taking way the stone or clearing the old mortar. Except Sam and I, who went shopping for lunch and for stuff for a barbeque - someone has to be the catering corps! We weaned our only ewe lamb today. Nellie is now in Sheepfold with the ponies and Dickie, our wether, who just happens to be her brother. She and Juno bawled for a couple of hours, then were fine. Juno's much more concerned about the lack of grass than losing her lamb. I've decided to bring the lambing period forward in 2011. I've always planned for a 1st April start date, but that was because I got school holidays and was off the first two weeks in April. 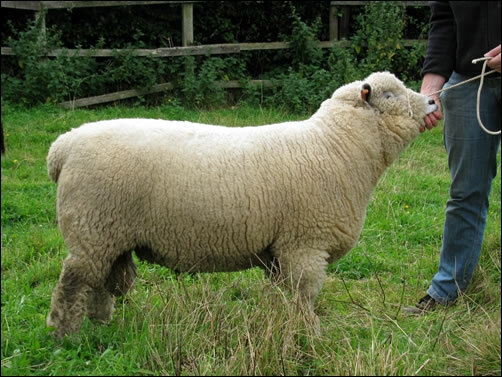 I'm going to bring it back to mid March, so the tup will go in mid-October rather than 5th November. That means I have to start flushing the ewes next weekend so I'll have to get prepared this week - no pressure! We received notification today that our planning application for the ground source heat pump and PV array has been approved without conditions. Dan's been in touch with the two installers and I've let the contractor who's doing the ground works know. This is really good news - getting the heating on will dry out the floor more quickly, which means the wood and tiles can be laid sooner. 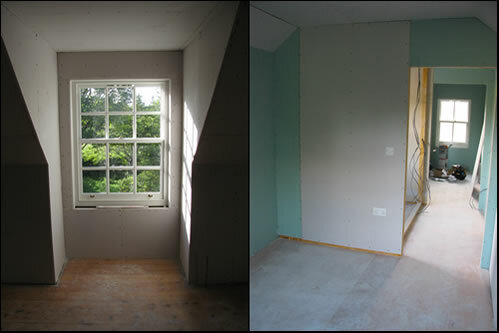 The joiners have been here today plasterboarding - most of upstairs is done - and they are back tomorrow. 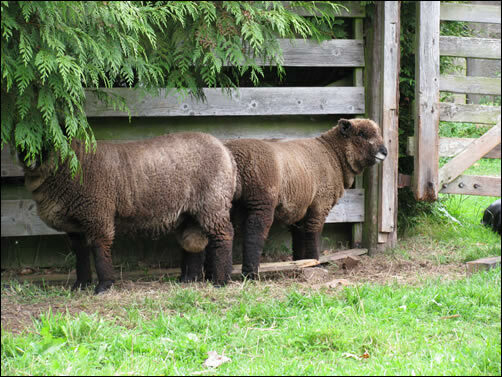 My original flock was three 2007 ewes; in 2009, they lambed for the first time and produced one ewe lamb so I bought another two by the same tup. This year, the three ewes again produced one ewe lamb, so I was keen to buy another two to maintain a year group of three. As well as putting my "wanted" request on TAS, it went in the Coloured Ryeland Group newsletter, which came out this week. 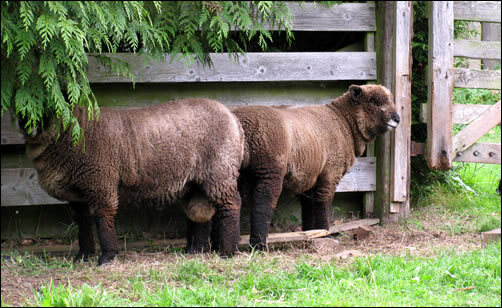 Yesterday, I got a call from Jackie Armstrong, who has the Grindon flock, offering twin ewe lambs for sale. She sent some photos and they're lovely, so the deal is done. We're picking then up early October. They are by Lightwater Hunky, from Sue Trimmings' flock out of Grindon ewes. Before I wrote this, I thought I'd review the last post on this subject. The steel for the barn didn't arrive but should this week. The upstairs is now pretty much all plasterboarded. The electricians have been putting in sockets and light switches, and the outdoor lights at the front door - they look very posh with the new door. The plumber was here yesterday and fitted the shower and the shower tray. We try to use as few chemicals as possible, without compromising our stock's health. Chemical wormers are one of the things we try to avoid. We use a herbal wormer for the sheep and the poultry but we also worm test. Last week, I did the three ponies. I use Westgate Laboratories and they've always given good service. Currently, they are doing four tests for £28, which is really good value. I sent of the samples on saturday morning and got the result emailed to me on Tuesday.